A new organodithiophosphorus derivative, namely O-(1,3-Bispiperidino-2-propyl)-4-methoxy phenyldithiophosphonate, was synthesized and then the kinetic behavior of the transport process as a function of concentration, temperature, stirring rate and solvents was investigated. The compound 1 was characterized by elemental analysis, IR, 1H and 31P NMR spectroscopies. The transport of mercury(II) ion by a zwitterionic dithiophosphonate 1 in the liquid membrane was studied and the kinetic behavior of the transport process as a function of concentration, temperature, stirring rate and solvents was investigated. The compound 1 is expected to serve as a model liquid membrane transport with mercury(II) ions. A kinetic study of mercury(II) transport through a membrane assisted by O-(1,3-Bispiperidino-2-propyl)-4-methoxy phenyldithiophosphonate was performed. It can be concluded that the compound 1 can be provided a general and straightforward route to remove toxic metals ions such as mercury(II) ion from water or other solution. In this paper, we reported the synthesis of O-(1,3-Bispiperidino-2-propyl)-4-methoxy phenyldithiophosphonate and the kinetic behavior of the transport process as a function of concentration, temperature, stirring rate and solvents was also investigated. The compound 1 was characterized by elemental analysis, IR and 1H- NMR and 31P- NMR spectroscopies. The reaction of 2,4-bis(4-methoxyphenyl)-1,3,2,4-dithiadiphosphetane-2,4-disulfide with 1,3-bispiperidino-2-propanol gave rise to the formation 1 which was previously synthesized (Scheme 1) . The spectroscopic data of the compound 1 was remained. The compound was obtained in high yield and was characterized by elemental analysis, IR, 1H-NMR and 31P-NMR spectroscopies. Although dithiophosphonates were usually obtained as liquid product, the compound 1 was obtained as solid product due to zwitterionic character in which the H atom of the initially formed P-SH group transferred to the piperidino group. The IR spectra of 1 showed its characteristic bands at 671 cm-1 for n(PS)asym and 548 cm-1 for n(PS)sym stretchings. Synthesis of the carrier 1. The 1H-NMR spectra of 1 indicated that the phenyl protons displayed doublet at 8.13-8.08 ppm (3JPH = 14.19 Hz, JHH = 8.81 Hz) and 6.90-6.87 ppm (4JPH = 2.45 Hz, JH, H = 8.81 Hz), respectively. The spectra showed the expected signals for piperidino and methylene protons. However, the proton on N atom was not observed in the spectra of 1H NMR. The 31P-NMR spectra of 1 displayed a quartet at 112.73 ppm because of the coupling with hydrogen nuclei and the presence of two isomer in solution(see scheme 1). In our previous report , the transport of Cu(II) ions from aqueous phase was carried out by using the compound 1 as the carrier. In this work, the transport of mercury(II) ion by the zwitterionic dithiophosphonate 1 in the liquid membrane was studied and the kinetic behavior of the transport process as a function of concentration, temperature, stirring rate and solvents was investigated. The mechanism of the ion pair mediated transport (co-transport) is given in Figure 1. L represents the carrier 1. At the interface between donor and membrane, metal picrate ion pair forms complex with ligand, then the [LM]+Pic- complex diffuses through the membrane. At the interface between membrane and acceptor, the carrier ion pairs are decomplexed and M+Pic- is liberated into the acceptor phase. Finally, the ligand carrier diffuses back across the membrane aqueous boundary layers. The variation of the metal picrate concentration with time was directly measured in both the donor (Cd) and acceptor (Ca) phases. In the experiments, the variation of picrate ion concentration with time was directly measured in both donor (Cd) and acceptor phases (Ca). The corresponding change of picrate ion concentration in the membrane phase was determined from the material balance between the phases. Mechanism of the ion pair mediated transport (co-transport) through liquid membrane M: Metal, Pic: Picrate salt, L: Ligand, [L-M] + Pic - : ion pair. where k1 and k2 are the apparent membrane entrance and exit rate constants, respectively. The kinetic scheme for consecutive reaction systems and the kinetic parameters of k1 and k2 from the obtained data were calculated by fitting equations as described in the previous studies [17–24]. 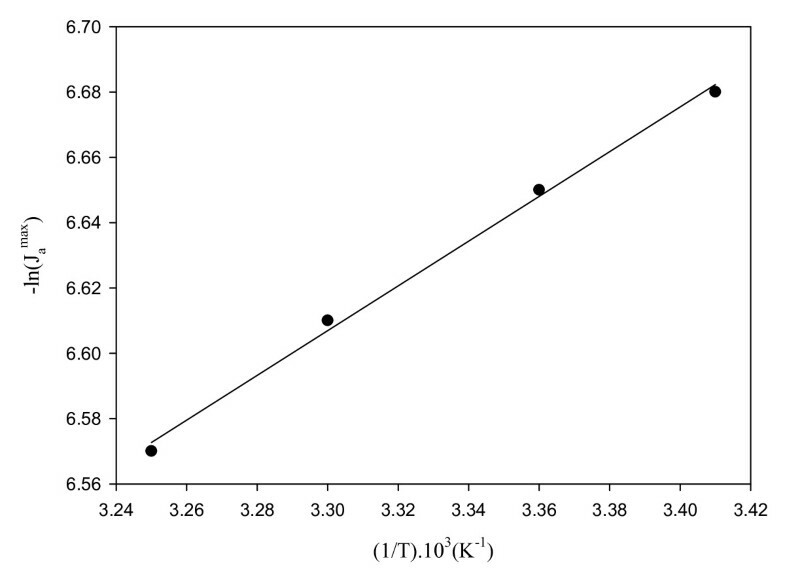 The variation of the reduced concentration of mercury(II) ion through the liquid membrane with 1x10-4 M of carrier 1 in CHCl3 at 300 rpm and 25°C is presented in Figure 2. The observed experimental results reveal that Rd decreases exponentially with time, accompanied by a simultaneous increase of Ra, whereas Rm presents a maximum at intermediate times. Time dependence of R d , R m , and R a for transport of mercury(II). Membrane:1x10-4 M of carrier 1 in CHCl3 (298 K and 300 rpm). The transport experiments were carried out at three different initial carrier 1 concentrations 1x10-6, 1 × 10-5, and 1 × 10-4 M in CHCl3 at 298 K and 300 rpm. The obtained kinetic parameters for the effect of concentration of carrier 1 are presented in Table 1. It was found that the initial carrier concentration influences the kinetic constants, as well as flux values and the results are in full agreement with previously obtained results [17–24]. 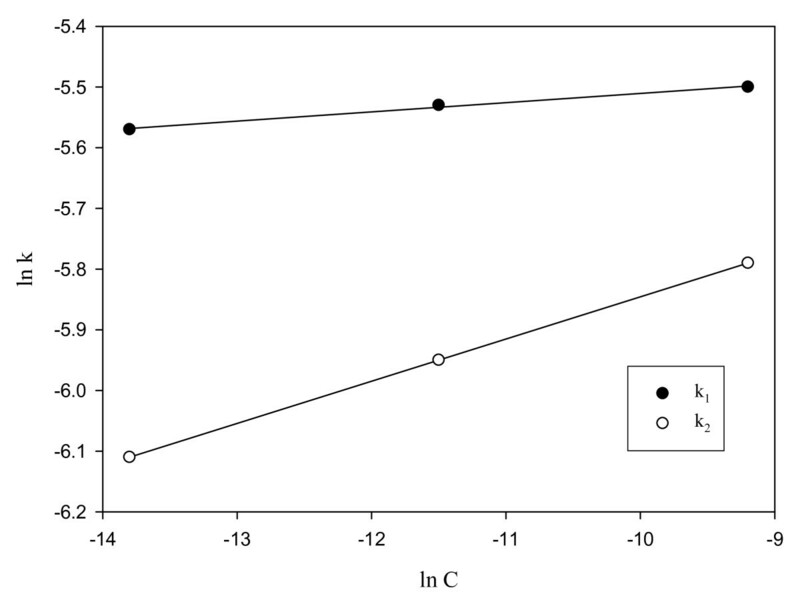 It can be seen that both kinetic constants k1 and k2 or fluxes are dependent on the carrier concentration and increases steadily with the initial carrier concentration as shown in Figure 3. In addition, a blank experiment was performed with no present carrier in the membrane. There was no evidence of the movement of the mercury(II) ions through the liquid membrane in the blank experiment. When the carrier was utilized, the transport of mercury(II) ions through the liquid membrane was performed. Concentration dependence of k 1 and k 2 for transport of mercury(II) with 1 (298 K and 300 rpm in CHCl 3 ). The effect of temperature on the transport of mercury(II) ions through the liquid membrane containing 1 × 10-4 M of carrier 1 in CHCl3 was examined at 293, 298, 303, and 308 K (300 rpm). The experimental results are collected in Table 2. It is quite obvious that k1 and k2 increases with an increase in the temperature. Table 2 also shows that tmax and Rmmax decreases with an increase of temperature. The activation energy was calculated from plot of the maximum membrane exit flux (Jamax) versus (1/T) at 300 rpm(Equation 3), as presented in Figure 4. 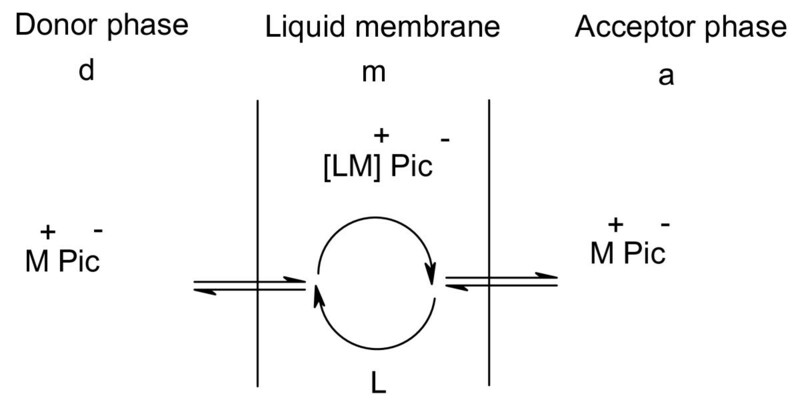 Arrhenius plots for transport of mercury(II) in liquid membrane. Membrane: 1 × 10-4 M of carrier 1 in CHCl3 at 300 rpm. The activation energy value for carrier 1 in the liquid membrane was found to be 1.36 kcal/mol by using the equation 3. As known, activation energy values are quite low for diffusion-controlled processes, whose rate constants are strongly affected by temperature . It was pointed out that the activation energies of diffusion-controlled processes are lower than 10 kcal/mol . The calculated activation energy for carrier 1 shows that the transport of mercury(II) ion is diffusion-controlled processes. To achieve effective mercury(II) transport, it is necessary to explore the effect of stirring speed on the transport process. 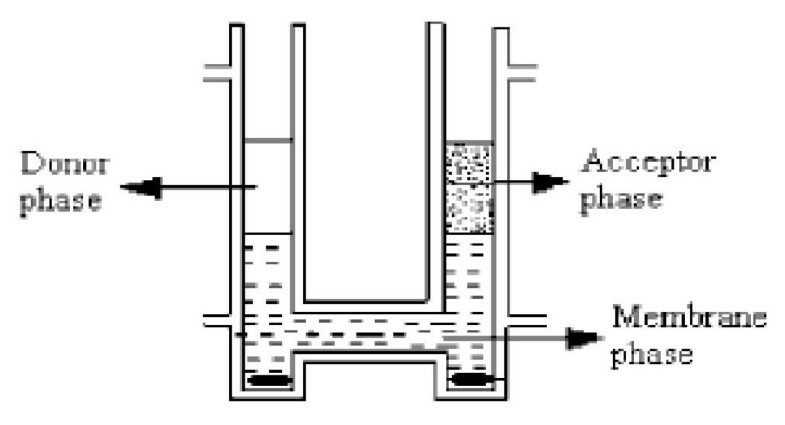 In the present investigation, the stirring rate of the membrane phase was carried out at three different stirring rate, 200, 300, and 400 rpm at 298 K when the carrier 1 concentration was 1 × 10-4 M in CHCl3. The results are given in Table 3 and indicate that the stirring rate affects the transport rate of mercury(II) through the liquid membrane. According to these results, the flux increases with increasing stirring rate due to decrease of the thickness of the diffusion boundary layers at both interfaces of the membrane. The present work was to investigate the physicochemical approach to co-transport of mercury(II) transport through a liquid membrane containing carrier 1. 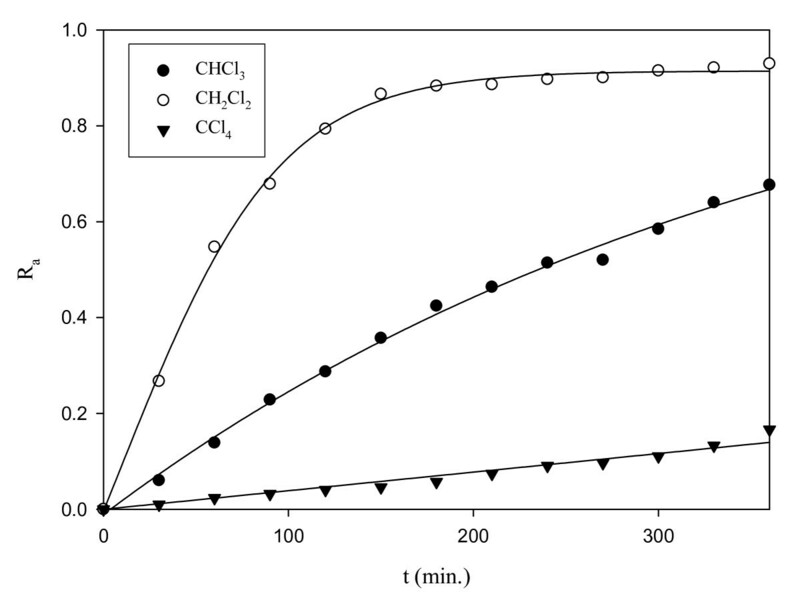 Therefore, the effect of solvents on the transport process was studied under the same conditions, and the results obtained with CH2Cl2 and CCl4 are presented in Table 4, along with analogous results for CHCl3. It has been observed that the membrane entrance and exit rate constants are found to vary in the order CH2Cl2 > CHCl3 > CCl4, and the variation of Ra values is illustrated in Figure 5. This shows that the Ra values are strongly affected by the membrane solvent system, and the higher transport efficiency was observed with CH2Cl2 solvent. 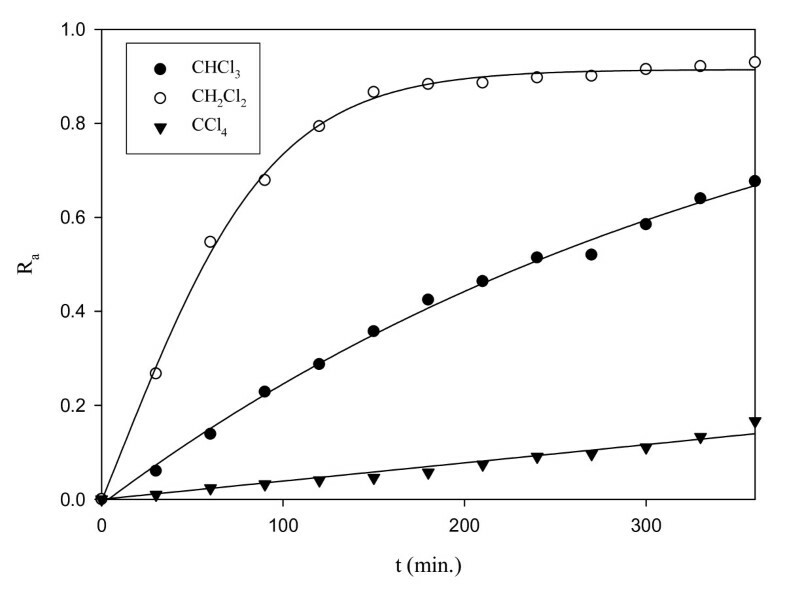 The efficiency of CH2Cl2 with respect to the Ra values was higher than of CHCl3 and CCl4, because their viscosity values were in the reverse order. 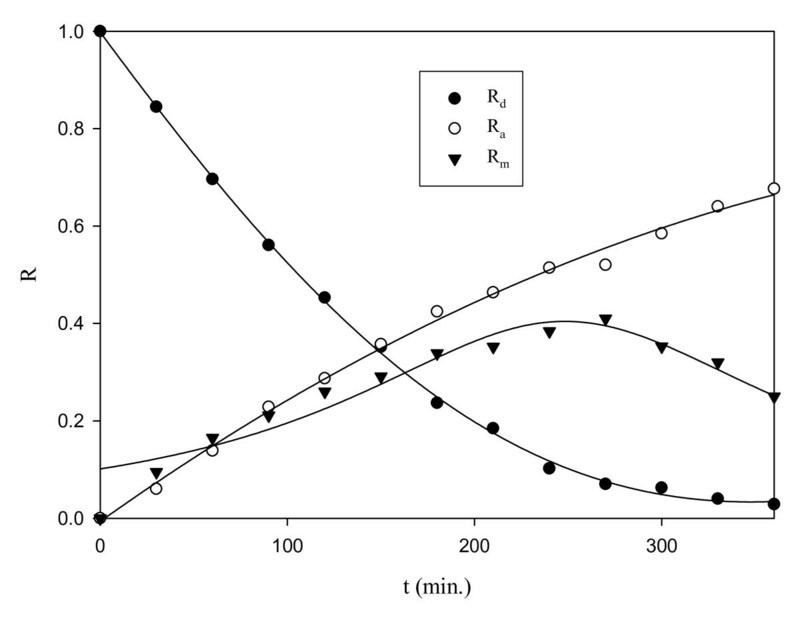 Time variation of reduced concentrations of mercury(II) in the acceptor phase during co-transport through liquid membrane using of carrrier 1 in different solvents at a stirring rate of 300 rpm. The physicochemical properties of the solvents are given in Table 5. These observations suggest that viscosity is playing a major role in ion transport as well as the polarity. Thus, we have shown that the nature of the membrane solvent is one of the main factors in establishing transport efficiency. ε0: dielectric constant (20°C); nD: refractive index (20°C); μ: dipole moment (D); η: viscosity (cP); Vm: molar volume (M-1). A kinetic study of mercury(II) transport through a membrane assisted by O-(1,3-Bispiperidino-2-propyl)-4-methoxy phenyldithiophosphonate was performed. The kinetic behavior of the transport process as a function of concentration, temperature, stirring rate and solvents was investigated. It can be concluded that dithiophosphorus derivatives can be provided a general and straightforward route to remove toxic metals ions such as mercury(II) ion from water or other solution. Solvents were purchased from Merck and distilled before use. 2,4-bis(4-methoxyphenyl)-1,3,2,4-dithiadiphosphetane-2,4-disulfide (Lawesson's reagent) were obtained from Aldrich. 1,3-Bispiperidino-2-propanol was synthesized by the methods given in the literature . 1H-NMR spectra were obtained in chloroform with a Bruker-DPX 400 FTNMR spectrometer. IR spectra was recorded on a Mattson 1000 FTIR spectrometer using KBr pellets in the range of 4000-400 cm-1. Melting points were determined with a Gallenkamp apparatus without uncorrected. The chemical reagents used in these experiments were mercury(II) nitrate, dichloromethane, chloroform, carbon tetracholoride and picric acid obtained from Merck. Mercury(II) picrate solution was prepared by the addition of a 1 × 10-2 M mercury(II) nitrate to a 2.5 × 10-5 M aqueous picric acid solution and shaken at 25°C for 1 hour. The aqueous solutions were prepared using demineralised water. Mercury(II) ion transport experiments were conducted using a thermostated (Grand mark, model W14, Grants Instruments, Cambridge, England) apparatus. Transport experiments were carried out in a U-type cell (Figure 6). An organic solution (20 mL) containing the carrier 1 was placed in the bottom of the cell and two portions of aqueous donor and acceptor solutions (10 mL) were carefully added on top of them. Both surface areas were 2.5 cm2. The organic phase was stirred at variable speeds magnetically (Chiltern mark, model HS 31). The initial phases consisted of the donor phase, an aqueous mercury(II) picrate (2.5 × 10-5M) solution, while the membrane phase was made up by dissolving carrier 1 (Ccarrier = 10-4 M) in the organic phase. The acceptor phase consisted of doubly distilled water. Samples were taken from both water phases (acceptor and donor phases) at various intervals of time and the picrate ion concentration was analyzed by a spectrophotometric method . The spectrophotometric measurements were performed by an UV-Vis Spectrometer Shimadzu 160A. Each experimental result reported is the arithmetic mean of two independent measurements. Bulk liquid membrane apparatus for transport of mercury(II) ions; d, donor phase; a, acceptor phase; m, membrane phase. 2,4-Bis (methoxyphenyl-1,3,2,4- dithiadiphosphetane-2,4-disulfide (Lawesson's reagent) (0.89 g, 2.21 mmol) was reacted with 1,3-bispiperidino-2-propanol (1 g, 4.42 mmol) in benzene (5 mL). The mixture was refluxed for 20-30 minutes. The product was obtained as orange solid. The orange solid was filtered, dried in air and recrystallised from CHCl3. The yield is 1.35 g (72%) and mp:178-180°C. Elemental Analysis Calc. for C20H33N2O2PS2: C, 56.04; H, 7.76; N, 6.53; S, 14.96. Found: C, 55.80; H, 7.52; N, 6.0; S, 14.58. IR (cm-1): 1035 n(P-O-C), 671 n(PS), 548 n(PS). 1H-NMR (CDCl3), d: 8.13-8.08 (dd, 2 H, 3JPH = 14.19 Hz, JHH = 8.81 Hz), 6.90-6.87 (dd, 2 H, 4JPH = 2.45 Hz, JHH = 8.81 Hz), 5.36-5.30 (m, 1 H, OCH), 3.81 (s, 3 H, OCH3), 3.03-2.99 (m, 8 H, orto protons to N on the piperidino ring), 2.91-2.86 (m, 4 H, bridge methylene H), 1.82-1.77 (m, 8 H, meta protons to N on the piperidino ring), 1.56-1.53 (m, 4 H, para protons to N on the piperidino ring). 31P-NMR (CDCl3), d: 112.73 (q, due to the coupling with hydrogen nuclei and the presence of two isomer in solution)(see scheme 1). This work was supported by TUBITAK Grant No: TBAG-HD/123 (106T034). MK has coordinated the study and characterization of the compound 1. NA carried out the synthesis of the compound 1. HKA and AK carried out the kinetic studies and participated in the design of the study. AOG and MA carried ot the synthesis of the starting metarials. All authors have read and approved the final manuscript.